It’s feel very odd to see a rig in the process of being constructed when we are so used to seeing only the finished product. This Ford Chassis has had cross members added to support the coach which will be built on top of it. The Ford V-10 6.8 liter Triton engine is the power plant for this gas rig. All of Coachmen’s diesel rigs have the engine in back. That’s one way to tell this is a gas powered unit–you can see the radiator up front. To be honest, I didn’t know much about Coachmen before I rolled in. I was going there for two reasons: first, to thank Ron Ross, the Service & Warranty Manager for all the help and support he’s provided me via email since I purchased my rig back in 2013; next because Ron had graciously agreed to look at the slide-out on my rig which was sticking a little under certain circumstances. 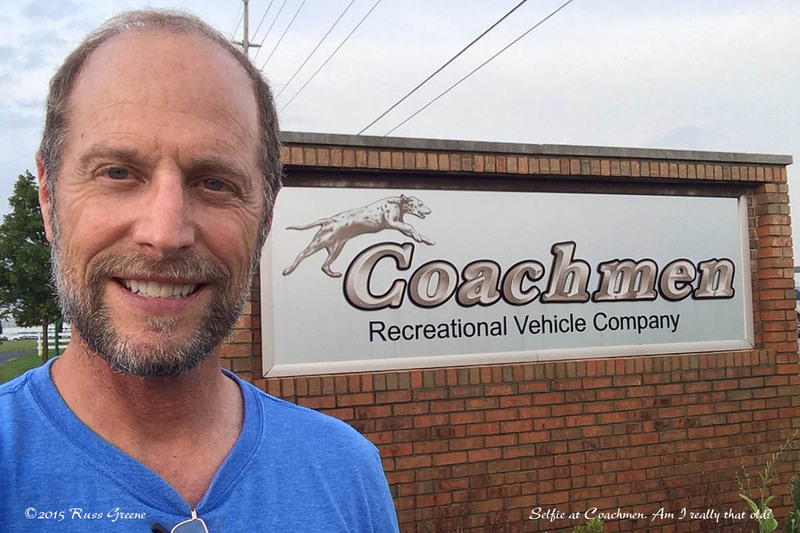 What I didn’t know before arriving at Coachmen was that they had a campground and a repair shop on campus, that I could get some free factory tours and a complimentary one year membership in the Coachmen Owner’s Association (COA). 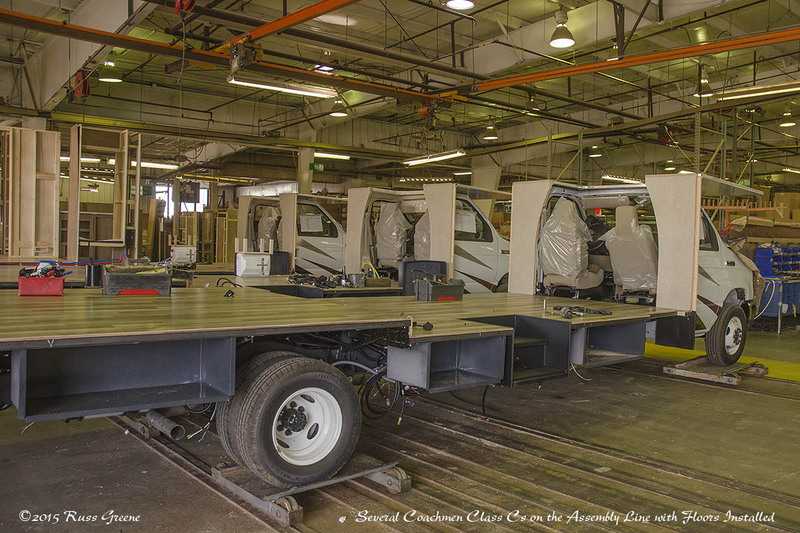 Early in the production cycle Coachmen Class C RVs have had their floors installed and under-floor compartments hung. Note that they sit on wheeled platforms. When ready for the next stage “3 burly guys”push them down the line. When I arrived at Coachmen I stumbled into the COA office after first wandering over to a building that turned out to be absent of any people. Someone there got Ron Ross on the phone and in a few minutes he came over and looked at my slide. Ron arranged to have someone at the repair shop look at it and they made an adjustment aimed at improving its operation. Also while I was at Coachmen the repair shop reseated some interior trim moulding that was coming loose, reinforced the flooring in the bedroom, and fixed some leaks at the back of the hot water heater. All that, and the campground were provided without charge! Holy cow! I should probably add that I purchased my rig used, with no warranty, so I truly got something for nothing here. Plus, Ron Ross has been enormously helpful to me via a great many emails we’ve shared since I first purchased my RV in 2013. 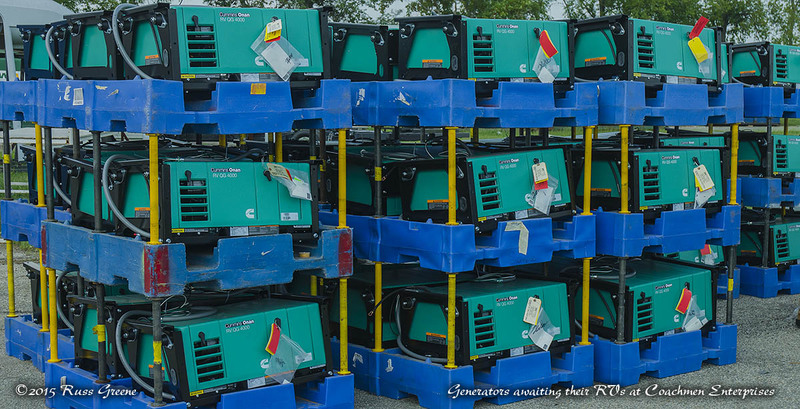 Piles and piles of Cummins-Onan generators are stocked for installation into Coachmen Class C RVs. Also during my visit to Coachmen I was given personal, individual tours through both the Class A and Class C manufacturing facilities. Everybody, everywhere at Coachmen was incredibly nice and accommodating. Talk about being made to feel like a king: all the personal attention, complimentary campground and repairs! I couldn’t say anything better about any company anywhere. But a few of the great many Ford E450 Cutaway Vans at Coachmen. Coachmen, in business for 50 years, makes RVs of many styles including: travel trailers, 5th wheels, Class A, both diesel and gas, Class B and Class C motor homes, popups. I think they also have a housing division that makes mobile homes. I could be leaving some things out. The campus is huge. I was really floored when I saw all the Ford E450 cutaway vans parked in different places around the campus. 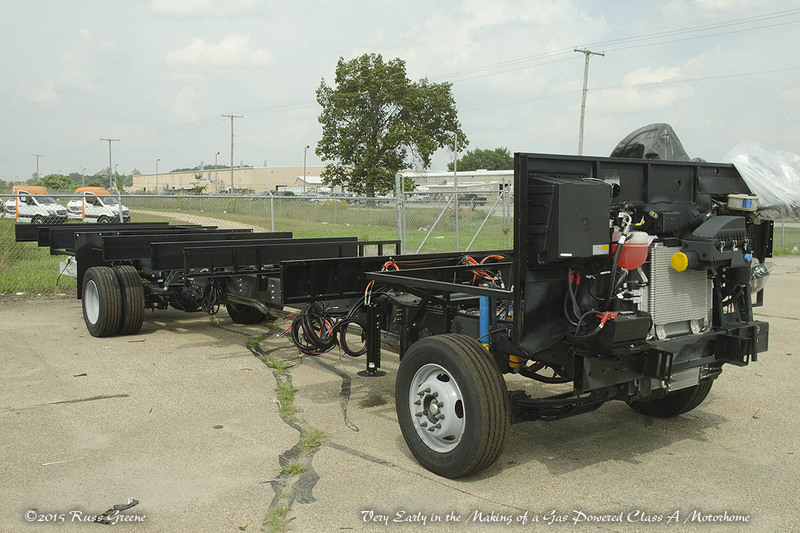 That’s the chassis on which they build most of their Class C motorhomes, the chassis upon which the whole RV industry builds most of their Class Cs. I was told Coachmen keeps enough E450s around for a 3-6 month supply and that they build up to 20 a day. That would be up to something like 2,400 E450s. The sticker price on those is $32,660. That equates to over $78,000,000 worth of E450s. Even at 25% off sticker it’s still near $60,000,000. Wow! 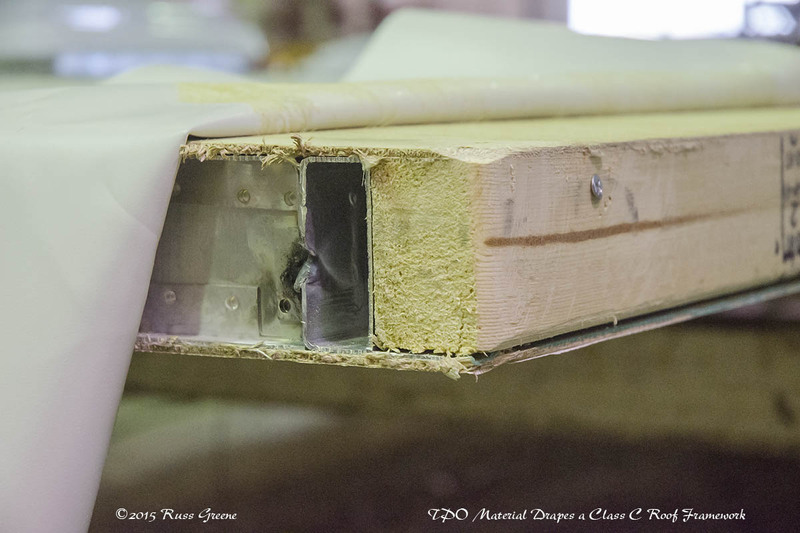 An unfinished corner of a Coachmen Class C roof reveals its innards. Luan on top and bottom with aluminum framing in between and wooden rails along the sides. Not visible is the insulation inside. TPO, the plastic roof membrane, what you will see on the top of the roof when finished, lays atop the roof ready to be wrapped onto it. 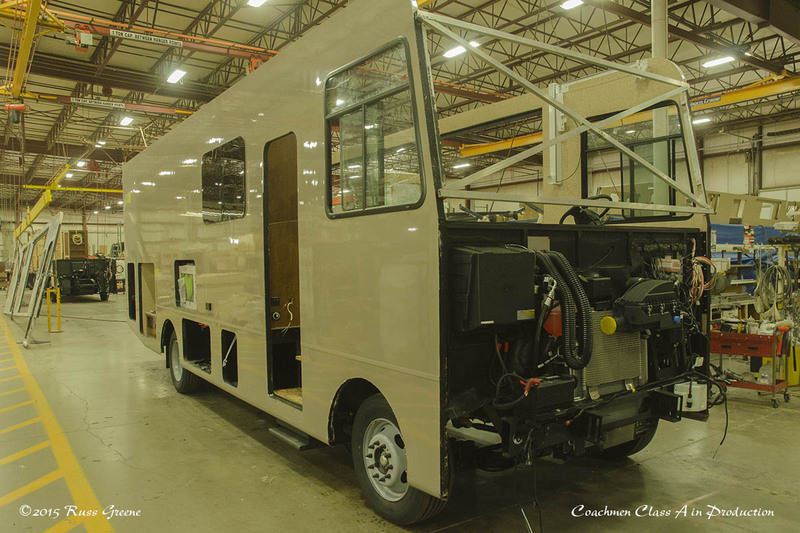 It was interesting to learn about the manner in which the motorhomes are assembled, to see them in their various stages, and the order in which they do things at Coachmen. The RVs look so odd at early stages of manufacture compared to the finished product we’re used to seeing, especially the Class A rigs. They may build 5 of those in a day. I didn’t tour the 5th wheel, Class B or travel trailer factories. 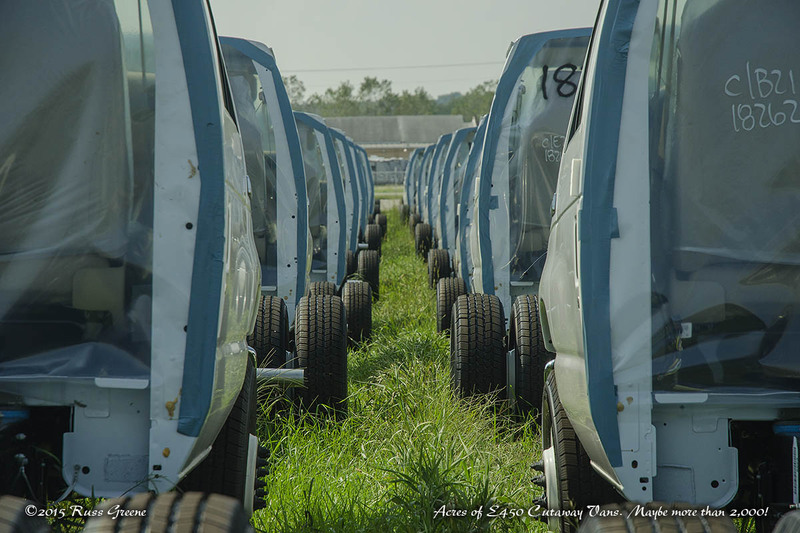 Coachmen was acquired in 2008 during the economic crisis by Forest River, the second largest maker of RVs in the states. They must produce dozens of lines, all told. I heard a rumor that since the acquisition Coachmen quality has suffered due to pressure put on from above over at Forest River. I spoke to someone at Coachmen who said that was just a rumor and that quality has actually improved. Someone else said that Forest River leaves them alone and as long as Coachmen is profitable Forest River will let them do their own thing. 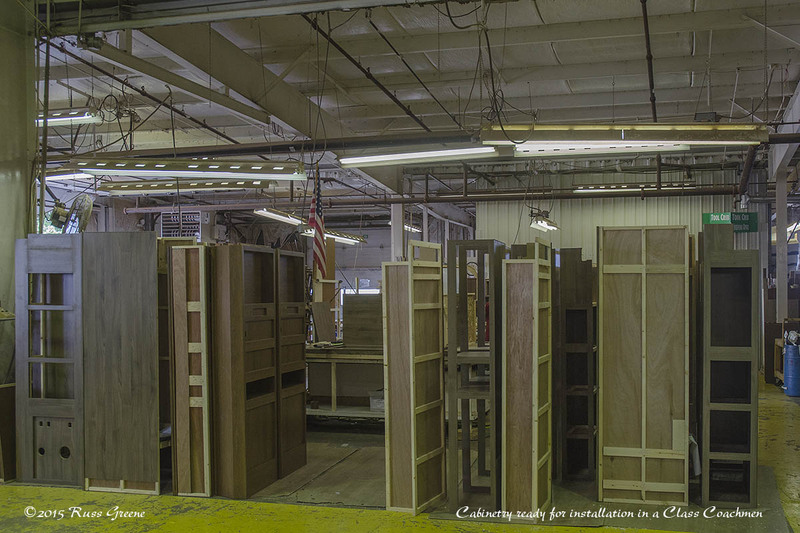 Cabinets built for Class C Coachmen RVs await placement into the new rigs. On the subject of quality I also learned something surprising: when business is good manufacturing quality may be less than when business isn’t so good. You’d expect it to be the other way around, right? The way it was explained to me is that when things are booming new employees have to be added and they don’t have the same level of experience or skill that more seasoned employees have. When times aren’t so good the people let go first are those with less experience. I’m sure this isn’t unique to Coachmen or even the RV industry. 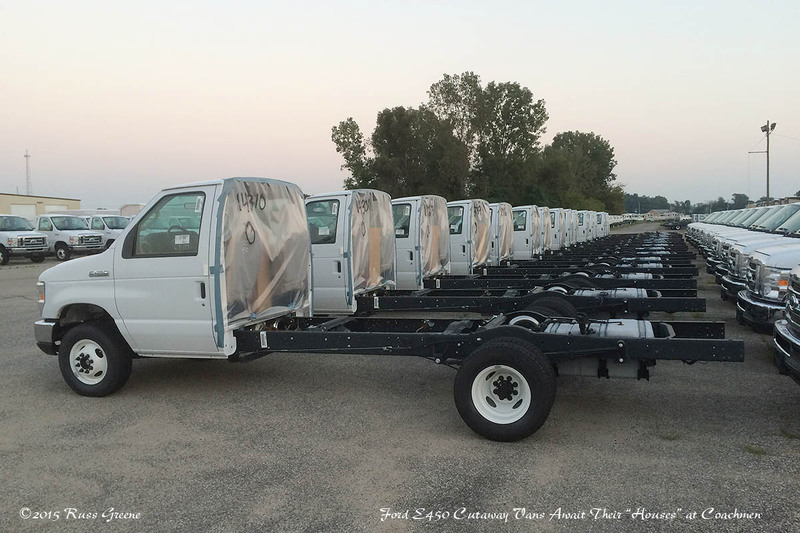 Coachmen builds more than one lone of trailers. Here, some the their Freedom Express units are ready to roll. It’s true, the RV industry doesn’t have such a good reputation for building quality products, not at the lower end of the price range anyway. You can spend over a million dollars on a big, top end rig if you’ve got it to spare and I expect the quality up there is better. Not that I’m ever likely to find out first hand. During my 16 months of RVing, living full-time in my rig, I’ve come across things that I thought indicated something less than optimum build quality, to be polite. To be fair, the Coachmen Freelander line, the kind of rig I own, is the low end line of the brand. Still, there are things that I think just shouldn’t be. Curtains, for example, that are assembled with tiny staples that are always falling out. I’ve picked up dozens of them during the past 16 months and have had to make numerous repairs to the curtains. There other places where staples were used that would have been better done with screws, and places where screws were used where they were driven, apparently haphazardly, through wood without pre-drilling tap holes. My cabover has leaked and been repaired, and leaked again, something I attribute to the design and build. One of the walls of the coach actually separated from the floor to which it was bolted–it was only held in place by a couple small bolts that just snapped, perhaps when I went over a bump in the road. 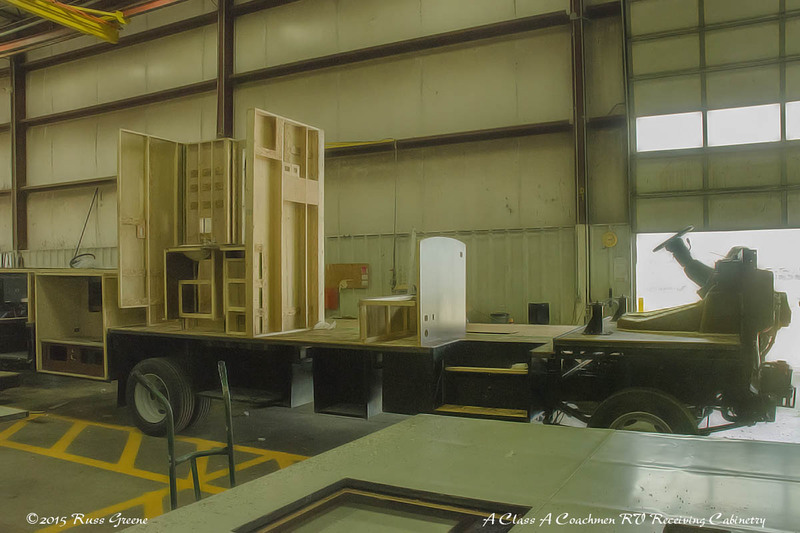 As is the case with Coachmen’s Class C units, the cabinets are installed on the floor prior to the walls and roof. I don’t think my rig is likely to be of any lower quality than other brands in the same price range, and it may in fact be better. Dunno. 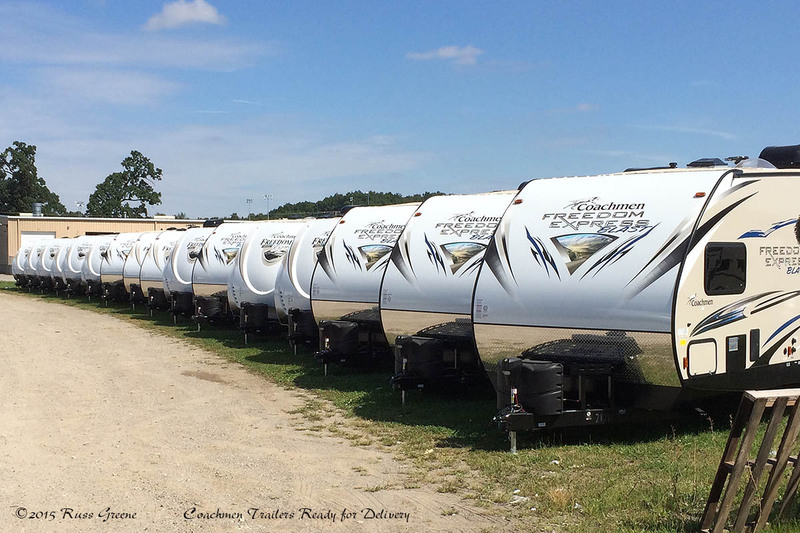 Someone at Coachmen explained to me that competition in the industry is fierce so that they have to constantly be on the lookout for ways to economize; that they could build a better product but it would cost more. I’m sure that’s true. Still, Porsche, Audi, and Mercedes build better, more expensive cars, but somehow they seem to find an audience. I think maybe the RV industry should try building better rigs. Maybe they’d find a better audience too. Probably the most popular platform in the RV industry upon which Class C RVs are built is the Ford E450 Cutaway Van. Coachmen keeps up to a 6 month supply on hand. Building up to 20 rigs a day, 100 a month, maybe more, a little quick math indicates they may have 2,400 of these scattered about the campus. Sticker price on these is $32,660. It’s the biggest single expense in building a Class C. If Coachmen pays something closer to $25,000 a piece and has that many E450s on hand that would be $60,000,000 worth of them. Many if not most RVs are not built for full-time living; warranties may include a disclaimer to that effect and may be voided if people live full-time in their rigs. I suppose it makes sense to use lesser quality materials and construction techniques if a rig is only going to be used 50 days a year, but what about those of us who want something more durable? I mean, it wouldn’t cost that much more to build something with better fabrics, using more screws and less staples, and a little more care in the way things are put together. OK, so having given myself the luxury of a little gripe-session-hissy-fit about what I perceive as the shortcomings of my rig, it must be said that has in fact held together–albeit with some assistance–for the time I’ve been in it and it served other owners before me. There is certainly no way I can complain about the way Coachmen has treated me. On the contrary, in that regard they are miles and miles and miles and miles above other companies with which I’ve had dealings. Selfie at Coachmen. Am I really that old? Don’t answer that! I ran out of time with which to visit other RV manufacturers in northern Indiana where many of them are located. It would have been interesting to see how they make their rigs and to compare one against the next. Maybe maybe next time through.